World Vision is committed to partnering with the people of Uganda to improve their lives today and to help deliver sustainable solutions for the future of their children, families and communities. Please pray for our work with the poorest children in Uganda. Sylvesti’s family live in a one room house. They sleep on the floor and have no bedding so they use old torn clothes to cover themselves. The roof leaks so when it rains they get wet as they have nowhere else to go. Their diet is mainly corn and beans so they don’t get enough nutrition to stay healthy and well. 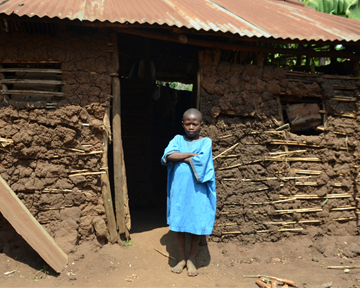 Although Sylvesti has been going to school, he sadly couldn’t sit for his primary school exams because his dad could not afford the £1.60 registration fee. He now has to repeat the year at school and hopes that he will be able to take the exam next time. Sylvesti does not have a school uniform or shoes and only has one exercise book which he uses for all his subjects. Please pray for Sylvesti, that his family would be able to save enough money so he can take his primary school exams next year and go on to secondary school. Pray that God will make a way for his father to find regular work to be able to buy their family food, clothes and pay for their hospital bills. Pray that God would surround Sylvesti’s family with hope, peace and love. Angela, 14 years old, has difficulty walking. She became ill eight months ago and her legs weakened progressively to the extent that she can no longer attend school. She lives with her single mother, who is a subsistence farmer. Her mother grows a few crops to try and feed her family. Her father died when she was a child. Angela was admitted to the rehabilitation centre over three months ago where she is getting treatment. Tests have revealed that she may need surgery. The family is in crisis as her mother, who is the sole breadwinner of the family, has to stay with Angela at the rehabilitation centre. Angela has lost hope since she can no longer go to school and feels her dreams of becoming a success and pulling her family out of poverty in the future have been shattered. Please pray that the healing hand of God touches Angela and that she will recover and be able to go back to school. Also pray that this vulnerable family can be adequately provided for. 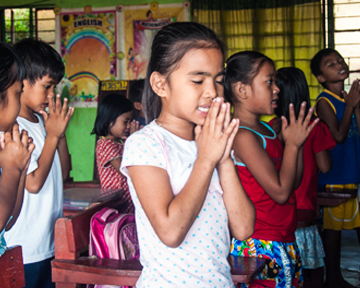 Please continue praying for 13-year-old Cecilia, who is living with her mother in a small village. She lost her father to HIV/ AIDS. She was also born with the virus and has been falling sick often. As a result she doesn’t attend school regularly. To add to her difficulties, Cecilia’s mother, who is the sole breadwinner in the family, is also suffering from HIV/AIDS which makes earning an income by farming really hard. Please pray for Gods divine intervention upon Cecilia’s family, that they can access the right kind of medical treatment as well as healthy, nutritious food. Pray also for adequate provision for this family, especially during the times when Cecilia’s mum is too sick to work. Last quarter, we submitted a prayer request for 10-month-old Isaac. His mother has suffered from postnatal depression since he was born. Isaac is still in the care of his paternal grandmother, who is a subsistence farmer. We are thankful to God that Isaac is being cared for and is growing well. He can now stand and is learning to walk. We thank our supporters for standing with us in prayer for this little boy. We please continue to prayer for his mother, that she can get the care, support and counselling she needs to recover and be with her children. John is five years old and is suffering with a skin disease. The doctors cannot seem to find a cause for his disease. He is at home as he cannot attend school. "I miss playing with my friends and staying at home is lonely " says John. His family is poor and struggles with illness. Please pray for John, that God will heal him and keep him and his family safe. May they be surrounded by God’s protection, love and peace. Pray too that our government works together with the local communities, hospitals and other NGOs to keep children like John safe and protect them from illness. Betty is 12 years old and is suffering from throat cancer. She was ill for a year and a half before she was diagnosed. Betty is from a peasant family and has little hope of getting adequate treatment. She has dropped out of school because of her illness. “When will I recover and join the other children in school?” she wants to know. She is losing hope. Please pray for her to be able to access medical treatment so that she can be healed and go back to school. We thank God for the rains that we have in abundance in our community. We sent a prayer request for rains after a long dry spell and were fearing a famine. We thank God that he gave us rains and most people in our community have got enough food.